Desks first appear in the late 17th century (1600's) as bureaus, i.e. a sloping front desk in which the writing surface can be opened and closed. They were an adaptation of the chest of drawers onto which the writing slope was fitted. The bureau has subsequently become a very popular form and was made in great numbers during the 18th century. They were closely followed in the Queen Anne (1702 – 1714) period by the kneehole-writing table. This was a small desk with drawers either side of a kneehole, which was often fitted with a central cupboard. These were either veneered in walnut or provincially constructed of oak. 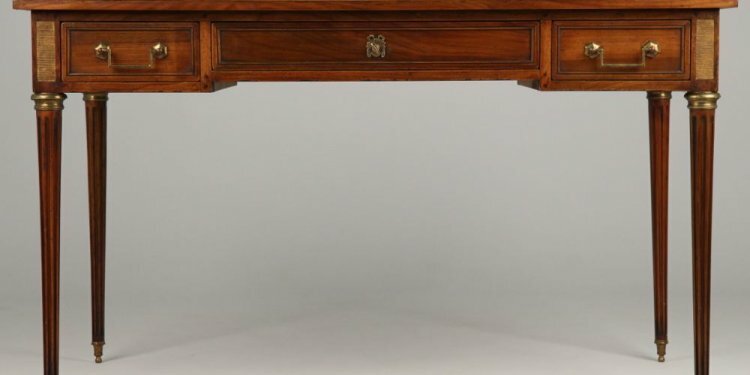 It is not until the 1750’s that we start to see the pedestal desk that has become so popular today. At this time the Caribbean islands made available mahogany, a wood which is richly figured and when polished and becomes a deep reddish brown colour. This wood was a luxury item and popularized by designers, such as Thomas Chippendale, who were working for wealthy patrons. Consequently most desks, which survive from the mid 18th century, were made for the country house library. They are often large, ornate, with carved embellishments, and command substantial prices due to their rarity. The advent of the UK Industrial Revolution, in the later part of the 18th and early 19th century, lead to the rise of a business class. This entrepreneurial group grew rapidly during this period and during the whole of the 19th century. They followed the fashions of the day and had a practical use for desks of all sizes within the workplace and at home. Although desks from the late 18th and early 19th century are not common they are available. They are generally made of mahogany or using mahogany veneers. Antique Writing table with Polished Wood top. They were designed for domestic use in the more affluent household that could afford furniture specifically for writing. As writing tables became more popular, with the growing middle classes in England, we start to see the introduction of the leather writing surface, which is a much more practical surface for a desk. The growth of industrialization and the proliferation of offices and administration roles in businesses lead to the development of the partners writing table where two people could share a desk or writing table with drawers to both sides. This was a much more sturdy type of writing table often made from mahogany with black leather writing surfaces decorated with gilt and or blind tooling. These are still very sought after today as they offer a very good working surface and 4 or six useful drawers. These large partners library tables or writing tables are also useful in homes as well as offices for their capacious surface, style and presence. Antique walnut sofa table or writing table with end supports and stretcher. Antique Partners Library or Writing Table with turned legs and wooden turned drawer handles. Gradually through the century the turnings of the legs becomes heavier and the drawer fronts become plainer as more businesses wanted work tables at a more affordable level for their employees. From around 1875 onwards traditional cabinet work, that had previously been done by hand was now being undertaken by machinery. Also at around this period we see a revival Old English Styles of furniture when the Aesthetic and Arts and Crafts movement began to have an influence on the fashions of the day. So at this time in English furniture making we see a proliferation of styles from Gothic and 'Old English' with the dark woods oak and heavy carving, through the simpler more elegant regency and wholesome hand-made Arts and Crafts designs trial blazed by William Morris. Consequently we see a huge variety of types of writing tables to suit all situations, tastes and budgets. There are small elegant tables that can easily be used as dressing tables or desks in a ladies bedroom or sitting room, as well as large heavy weight partners tables that can be used as dining room tables occasional tables as well as desks.